South Korea is resisting a Trump administration demand for sharply higher payments to defray the cost of basing US forces on its territory, raising fears that President Donald Trump might threaten a troop drawdown at a time of sensitive diplomacy on the Korean peninsula. 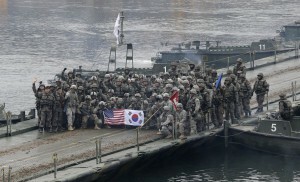 US negotiators have sought a 50 percent increase in Seoul’s annual payment, which last year was about $830 million, or about half of the estimated cost of hosting 28,500 US troops, according to two US officials familiar with the discussions. The US stance reflects Trump’s view that US allies have taken advantage of American military protection for decades _ a view resented by many South Korean officials, who say they already pay more to the US than almost any other American ally except Japan. Talks that began last March on a five-year funding agreement were suspended after negotiators did not agree on a new by the end of 2018, when the last agreement expired. South Korea, which initially called for adjusting annual payments only to account for inflation, is expected to make a counteroffer this month, but it is unlikely to satisfy the White House, US officials said. The standoff is straining the long-standing alliance as Trump plans a second summit with North Korean leader Kim Jong Un to renew the US push for elimination of Pyongyang’s nuclear arsenal, and South Korean President Moon Jae-in is pursuing his own rapprochement with Kim. South Korea in anxious about a potential withdrawal of US troops if an agreement can’t be reached, and umbrage over hardest bargaining from its closest ally since the Korean War, which ended 66 years ago. Song, who belongs to the same party as Moon and supports engagement with North Korea, said he believed that threats to remove US troops are a negotiating tactic and would not happen given America’s broader strategic interests in northeast Asia. “President Trump could again threaten to reduce troops, either as a negotiating tactic or to fulfill his campaign promise that Seoul has to pay 100 percent of US troop costs or he would remove them,” Klingner said. “Conversely, President Moon could insist he won’t pay any higher reimbursement costs even if it means… fewer US forces.” Either scenario could lead to “a premature reduction of US forces in South Korea,” he said. Trump’s ability to withdraw troops is limited, however. Congress last year passed a law barring the Pentagon from reducing troop levels in Korea below 22,000 unless the president certifies to Congress that doing so is in US national security interest. Negotiators are considering various ideas to break the impasse, including having South Korea pay a portion of the US cost of joint military training exercises, or to help defray costs of deploying US bombers, warships, missile defense batteries and other military assets when tensions with North Korea are high, according to one of the US officials. A commitment by Seoul to pick up some of those costs could help Trump claim that he succeeded in forcing a key ally to pay more for the cost of US military protection. But major US-South Korean military drills have been suspended since June, when Trump stopped them after his first summit with Kim in Singapore. In addition, the cost of such exercises is tiny compared with what South Korea pays every year for hosting US troops. The last funding agreement, signed in 2014, increased Seoul’s contribution to more than $830 million a year. That’s about half the annual cost of keeping 28,500 US troops in South Korea, not counting salaries and other personnel costs the Defense Department pays no matter where the troops are posted. The money doesn’t go to Washington, however. It’s used to pay salaries of Koreans working on US bases in South Korea, or is in the form of noncash contributions of services and construction at US installations there. South Korea also is funding more than 90 percent of a $10.8 billion construction project that will allow US troops to move from bases near Seoul and the Demilitarised Zone along the border with North Korea to new installations farther south. Song, the South Korean legislator, said that such favourable terms ensured that Trump would not pull out in the end. Song said he viewed the haggling over cost-sharing as a practical matter that wouldn’t influence the US-South Korean alliance. Many conservatives in South Korea, though, worry that the stalled talks are signs of a fraying relationship. He said South Korea could easily pay the increase given that its defense budget tops $42 billion this year. Park said he believed that Trump was seriously considering removing the US troops in Korea while Moon was forced to cater to a political base that includes student activists who have historically opposed US military presence in Korea. In a news conference this week, Moon said he believed that Kim Jong Un understood that the presence of US troops on the Korean peninsula was not directly tied to whether North Korea gives up its nuclear arsenal. Mike Bosack, a US Air Force captain who worked on cost-sharing negotiations with Japan from 2014 to 2016, said the Trump administration was jeopardising its alliance with South Korea. Bosack said the brinkmanship would benefit North Korea by potentially making the US military less popular in South Korea and driving a wedge between Washington and Seoul.